Immerse yourself in Bali's ancient culture on a 6-hour tour. 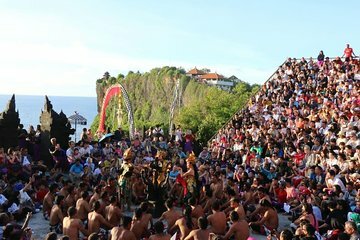 Air-conditioned transportation takes you from your hotel to Uluwatu Temple. Take time to explore the grounds independently, then watch the sun sink into the sea. Later, enjoy the famous Kecak Fire Dance, which includes a special chant from the Ramayana. After the performance, you can have a beachfront seafood dinner (at own expense) or return directly to your hotel.